It’s a cold and rainy day here in Walnut Creek and, with that, comes the urge to snuggle in to our cozy little house and cook something delicious from scratch. And what better inspiration for utterly delicious and heartfelt recipes than Alice Waters’ Fannie at Chez Panisse – her children’s book that also doubles as a cookbook of fresh, wonderfully savory and child-friendly recipes. 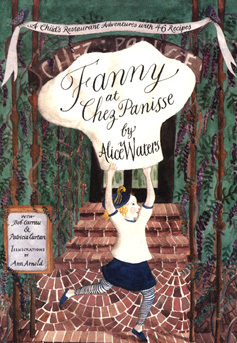 The titular Fanny is actually Alice’s real daughter and the first part of this book chronicles Fanny’s adventures at Chez Panisse, Waters’ award-winning restaurant in Berkeley, CA (which, if you’re ever in the neighborhood, you really must come!). The cooks, the bakers, the waiters and the maitre-d are all part of Fanny’s extended family and we all get to meet (and love) them in the process. And then, the recipes begin. And, oh, what recipes. Lettuce salad, 1234 cake, Peach Crisp and many more that will delight not just the children, but any adults who make their way into their delicious path. And did I mention the illustrations? Berkeley artist, Ann Arnold’s, watercolor prints are what make this book beyond spectacular. Just a hint..this book makes a delightful housewarming gift for children and adults…..a charming and lovely little treasure of a book.